Birth certificates must be on file at Conway Recreation Center or with Eastside Blaze Administration. Practice: The first day of football practice and cheer leading is tentatively scheduled for July 30th 2018. 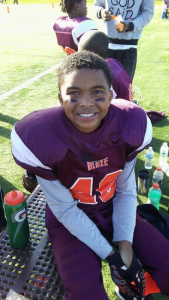 Eastside Blaze football is run by a volunteer based athletic association, our teams practice Mon – Thurs. until Labor Day. After Labor Day practice days are Mon, Tues, and Thurs. Practice times may change based on coaches availability. Coaching: All coaches are volunteers, must pass a background check, and become certified through the city of St. Paul. All coaches must be approved by the EYAA board of directors. Game Dates and Times: All divisions will play Saturday mornings/early afternoon with the occasional Tuesday or Wednesday evening game. Information on games schedules will be given during the mandatory parent information meeting. Equipment: Each player will be issued a helmet, shoulder pads, pants, game jersey and practice jersey. All equipment is expected to be kept in good condition, washed regularly, and returned at the last game of the season. Parents will be responsible for lost, stolen, or damaged football equipment or cheer leading uniforms. Football jerseys and cheer leading uniforms may be purchased for an additional fee of $40 at the time of registration. To purchase a jersey please clink one of the links below and register. More information will be given during a mandatory parent information meeting during the season. Click the links below to register for the 2018 youth football season.